Like so many other people, I was super excited when Glossybox announced they would start shipping to Canada. Anyone who reads this blog knows that I'm pretty much obsessed with various beauty boxes and I'm always excited (and sometimes overly impatient) to find out what I'll be receiving each month. The biggest reason I love beauty boxes so much is that along with brands I've heard of, tried before or wanted to try, they're always exposing me to new brands. There's nothing better for a beauty junkie like myself than to get exposed to new brands and products to add to my collection. Glossybox is definitely no exception to this, with a focus on higher end brands and deluxe sized samples, as well as literally the most beautiful and special feeling subscription box packaging I've ever seen. March's Glossybox* is filled with goodies meant to give a sense of hope as we enter the spring months... Gotta tell you, since Canadian winters seem to drag on long past when we're all whimpering and begging for spring, anything that inspires spring hope is good for me! Keep reading to take a look at what I received in my March Glossybox*! 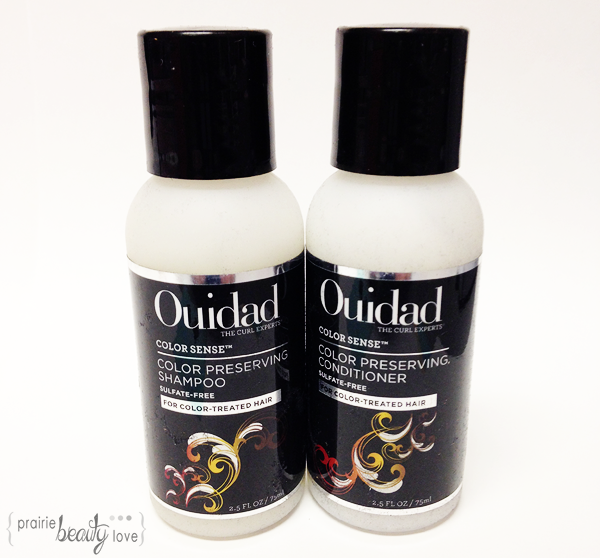 "If winter has left your hair dry, give it some tender lovin' care. This nutritive blend of apricot oil and honey infused antioxidants and protects color from fading. Use the shampoo to remove daily mineral deposits, and the conditioner to protect against dehydration for healthy-looking, radiant hard." For me, using good hair care products is a must in my routine recently because, even after a significant trim, I've got a fair bit of bleached out balayage in my hair and that requires all kinds of TLC so as not to feel like straw. I've definitely been all about using colour safe products in my hair ever since I dyed it red last month, so this was a really welcome addition to the box. I did try these out and I am really, really into them. With sizes like this, I like to get as much out of a bottle as I can, and I think that'll definitely be easy to accomplish with these because it actually only took a little to get my hair both nice and clean with the shampoo and also silky and soft with the conditioner. "Inspired by the medicinal benefits of gold throughout history, this luscious day cream contains vitamins, anti-oxidants and yes, pure 24 karat gold, which words to reduce the signs of aging by plumping and firming skin." I'm really looking forward to using this moisturizer as soon as I get through the one I'm working on at the moment. This moisturizer is rich and emollient, smells beautiful, and sinks into the skin to a silky, beautiful finish. I feel like this will really be a great daytime moisturizer because it leaves such a nice feel on the skin and I think that'll really work well under makeup - which is always my number one concern when it comes to what I'm putting on my skin for day. 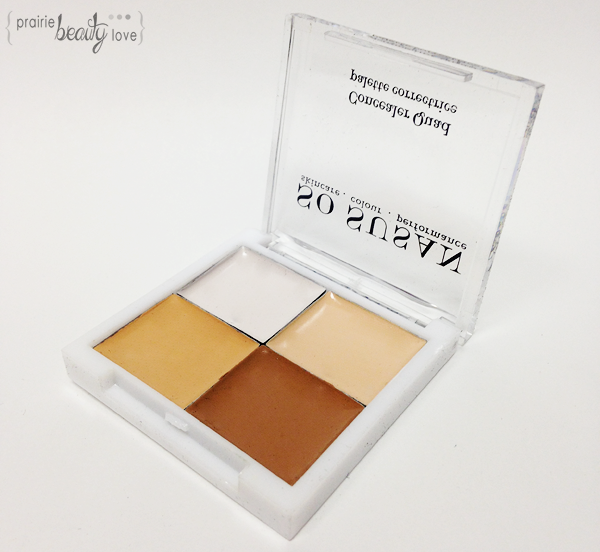 "This mix and match concealer quad has you covered - no matter your skin tone. The hypoallergenic formula stars hydrating virgin marula oil, perfectly covering blemishes and minor imperfections." This product is a little bit strange for me. I love that you get four different shades and do feel like it could work well for subtle contouring on the face, but it's quite sheer and needs to be warmed up a bit with your fingers in order to get some real pigmentation on your face. It is a really slick, smooth consistency that just melts into the skin, which is quite nice for when you want a light makeup application. For me, this just doesn't have quite enough coverage to take care of my zombie shadows and dark spots, but I think would work well for people with minor imperfections. "For a healthy flush reminiscent of a spring day spent outdoors, this girly lip and cheek stain blends seamlessly wherever it is applied. 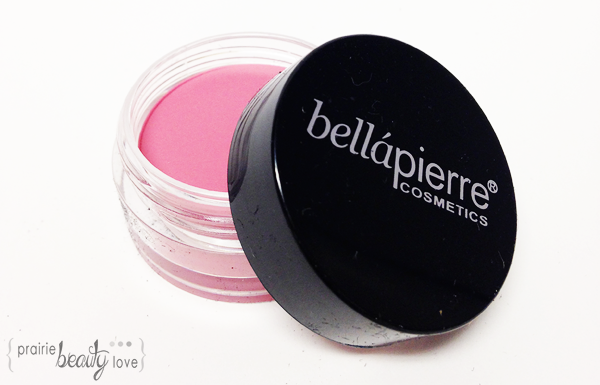 The oil-free, mineral based formula is lightweight yet perfectly pigmented." You guys. This is so freakin' pretty, I can barely stand it. I feel like this is going to be absolute gorgeousness this spring when the weather dictates that it's time from brighter, poppier cheeks. I love cream products for the cheeks in the spring and summer and the colour on this one is just perfect for those months. It's a drier formula than some other cream blushes I've tried, but I actually quite like that because it isn't going to leave a greasy look on my face or move around too much throughout the day. I legit can't wait to wear this, so I'm not going to bother waiting until spring. It's happening! "Achieve natural-looking, fuller brows instantly with this quick-dry gel formula that contains hair-like particles to create the appearance of fuller, more even eyebrows. 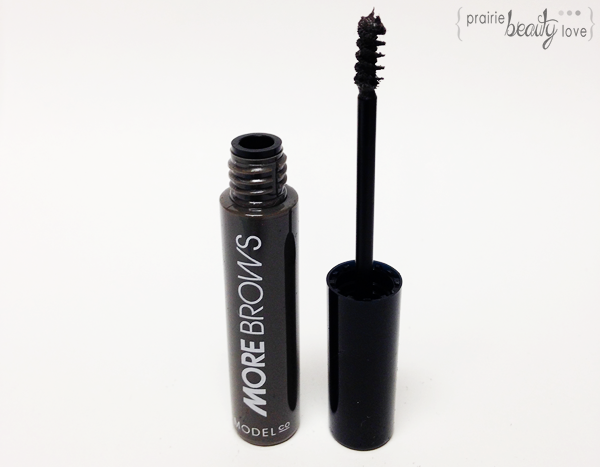 Perfect for women with naturally sparse or over-plucked arches, More Brows will take you into Brooke Shields territory in seconds." I've used this a couple of times since I received this box and I'm still trying to figure out how I feel about it. There are a couple of reasons why I'm torn. The first is that I think it might be a touch too dark for me, which is obviously not the fault of the product. However, I can still get it to look fairly natural in my brows if I'm careful. In fact, I find that this gives a really natural, full look to the brows when you use a nice light hand. The second is that I think it might flake... although that only happened the first time I wore it and might have been more user error than product failure. I'm going to keep using this and form more firm thoughts about it. 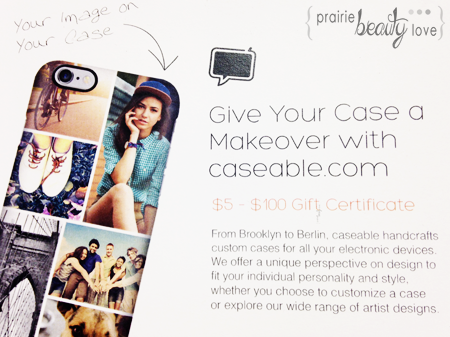 Also included in this month's box is a gift certificate code for caseable.com that will amount to anywhere from $5 - $100. I tried the site out when I first got this and it is very, very cool, with a wide selection of device cases as well as both pre-designed cases and the option to completely customize. I will definitely be taking advantage of this and getting myself a phone case with some Doctor Who art on it. Because I nerd like that. What's uo? Overall, I think this is a great box filled with some really good products and a pretty high value (Over $100 at my calculation.) The real winners for me are the shampoo and conditioner as well as the moisturizer, all of which I've used multiple times since receiving this box. The full size of the moisturizer is a little spendy, so I'm not sure I would buy the full size, but I'm already in the process of tracking down the hair products. I also like that there's a selection of different makeup products in this month's box, which is always exciting for me! Glossybox is a monthly online subscription service that curates boxes filled with 5 samples of various beauty, skin care, and haircare products delivered to your door for $21 a month (Plus $5 shipping for Canadian customers). Each month you'll receive a beautifully packaged blush toned box that makes for great reusable beauty storage filled with 5 different products to try out. Head over to Glossybox and sign up to get your hands on the March box as well as all of the great future boxes! 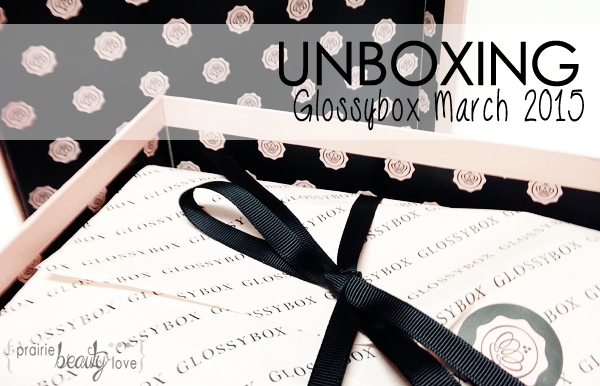 **March 2015 Glossybox was provided for review. All opinions are honest and my own.